Here we are - our third night out already. The first night was in a lovely vineyard near Yakima - just us in the middle of the grapevines. 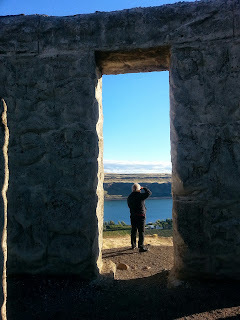 Last night we were at Peach Beach just below Maryhill Museum of Art and the Maryhill Stonehenge War Memorial. That's Liz framed by the Memorial, looking at Oregon across the Columbia River. These two attractions were both very worthwhile - a fabulous art museum in the middle of nowhere and a complete reproduction of England's Stonehenge, devoted to World War I veterans. Both were created by philanthropist Samuel Hill.